The central of this figure painting was the little daughter of the Spanish king Philip IV Princess Margaret. She was in the center of the painting and exuded the graceful manner. A maid on the left knelt down and offered some refreshments for her. But the princess disregarded her and seemed quite willful. A maid on the right was bowing down to pray her to have dinner or do others? 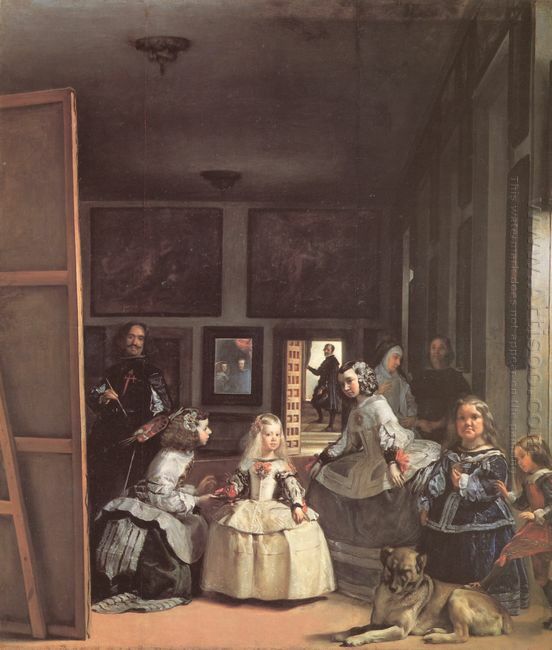 On the lower right corner of this Velasquez painting, there were two dwarfs for fun of the court and a sleeping dog. Two eldest servants standing behind the princess may be the regulators of the daily life in court. They seemed to be talking about something and had been interrupted. The most interesting thing was that Velasquez placed himself in the painting. He held the palette and stood on the huge canvas board. Actually he was drawing a portrait for himself. Velasquez deliberately highlighted the knighthood he wore to show his nobleness, which was his dream. The soldier stood in the portal of exit and did not straighten his body. One of his feet was on a lower level. And at this time, people in the whole painting looked to the front. What what attracted their attention? The figures reflected through the mirror on the wall were the king Philip IV and queen Margaret, as we knew. They attracted all eyes. But, was it Velazquez that drew the portrait for the king couple portrait? Is the sudden coming of the princess Margaret that brought trouble for the painter or the immediate show making the whole story with a dramatic change when Velazquez made the painting for the little princess because of the princess’s caprice? Besides the honorable Margaret princess, each figure showed an air of panic and only the artist was so calm. But at this time, the light coming through the side window framed the painting in this moment. This moment was like the shutter of the camera that quickly grasped the scene, which was so real and unknown. had the same size of each object and the real figure, which showed Velazquez’s superb techniques. The artist portrayed every object perfectly. Treatment of texture, shape, space, light and shade made people overwhelmed with admiration. What the painter showed to people was a “real” statue of time fragment.